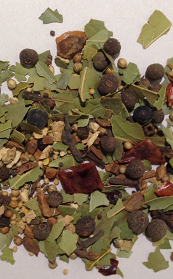 What Are Pickling Spices Recipes? Canning means to preserve foods in bottles and jars (see above). Although the "canning and pickling season" is conducted throughout the year depending on where in the world you’re located, for you it is whenever you’re doing a lot of harvesting of your garden (typically from early to late summer and early fall). Just depends on what is plentiful in your garden, or is available and cheap at local produce markets. By blending your pickling spices, which is quick and inexpensive, you can make the mixture just right for your taste buds. Wrapped in cheesecloth or a light-weight towel, crush the cinnamon sticks, dried chili pepper, ginger root, and bay leaves with a mallet. Place in a bowl with the remaining ingredients, which some people like to grind up coarsely. Don’t have to though. Mix thoroughly and store in an airtight jar in a cool dark place for up to one year. What is pickling salt and how does it differ from regular table salt? Pickling salt is fine grain in texture and free of any additives such as anti-caking agents which can make brines cloudy. Regular table salts tend to be a little coarser and usually include anti-caking additives. If you cannot find "Pickling Salt" in your local markets you can use any fine-grain salt that excludes additives. Pickling spices add a tasty zip to canned cucumbers, tomatoes, other vegetables and foods (e.g., eggs, grapes, beets). 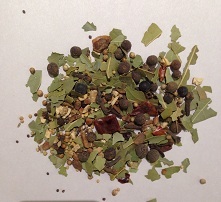 The herbs and spices in the pickling blend are similar to those in corned beef blends. So, in small amounts, pickling spices can be used for braised meat dishes.